Here's a fun attempt at combining two SCS challenges. I incorporated the Olympic Rings into this card. At SCS yesterday, the TLC #TLC261 "It's In The Pieces" challenge was to use PUNCHES as paper pieced art. 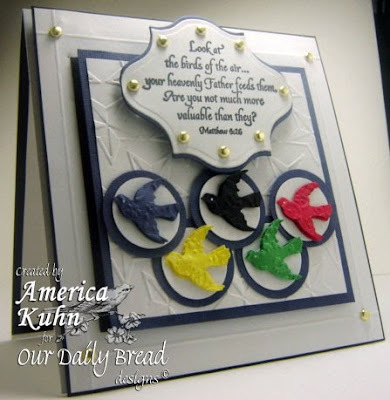 I punched my birds with a Martha Stewart Punch, ran them through the cuttlebug embossing folders then double layered them and placed them on Circles punched with CM circle punches. Also at SCS today, the color challenge #CC259, was to incorporate from 1 to 5 of the Olympic colors into our card creations. I dint get too fancy or caught up in this card at all. JUST HAD TONS OF FUN punching and putting it all together. 1. Mar 1 is our new release and the ODBD DT is having a blog hop with prizes! 2. ODBD's Second Anniversary is Mar. 17th - and there will be five whole days of exciting events planned in celebration. 3. There will be Daily Challenges running from Mar. 13 - 16th. These challenges will be announced on March 7th on the ODBD Blog - so you'll have a chance to get started early on them. 4. Each challenge will run one day. The winner will be announced the next day. 6. Start early so you don’t miss out on any of the great prizes that will go along with these ODBD events. 7. I will personally offer some fun blog candy along the way to help ODBD celebrate! SOOOO AWESOME and SOOOO creative America! America this is absolutely incredibly creative!!!! WOW!!!!! How smart you are! Love this card! You Go Girl this is FABULOUS!! WOW America! I really like what you did with this card. I wondered if anyone would something for the olympics. This is great and the sentiment works too. Wow a great card...! Love the details!! Love your card that is so cool how you incorpated the olympics into it. Thanks for the heads up on the ODBD blog hop and anniversary too, that should be totally fun and will be looking forward to it. Thanks for sharing your lovely card.